This is a test about School. 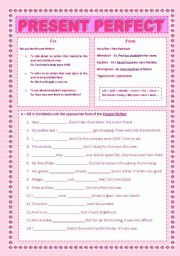 There´s a text with comprehension exercises and grammar exercises (to be; question words and prepositions of time). Finally, the students must write a text based on their personal information. 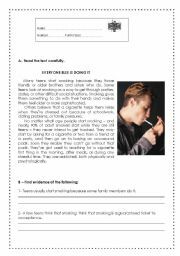 This is a reading comprehension worksheet about smoking. Students practice their English and at the same time understand why many smokers started when they were teens. Test about school subjects and facilities. There are four parts: reading comprehension, vocabulary, grammar and writing. 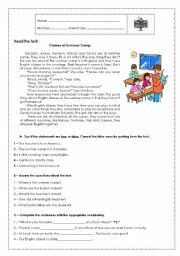 This test has four parts (reading comprehension+vocabulary+grammar and writing). The text describes the Simpsons as a family. Test about jobs. 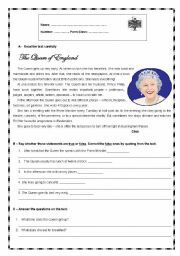 The students read about the Queen of England.There is a True/False exercise and some questions on the text.After, they must identify various jobs and describe them.There are some exercises with the present simple and the adverbs of frequency. 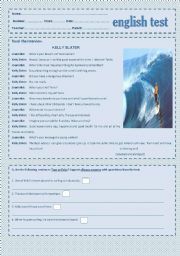 TEST- The best surfer ever!!! 8th grade test about sports. There are four parts: reading comprehension, vocabulary, grammar(past simple vs past continuous), modals (must/mustn´t vs have to/haven´t to) and writing. I hope it´s useful! 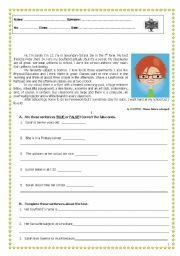 This worksheet may be used as a diagnostic test. It consists of a text about school, comprehensions exercises, present/past simple, possessives and a writing activity. I hope it´s useful!!!! Hugs! 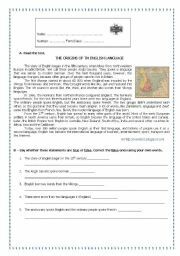 Test about the history of the English Language.There are four sections: reading Comprehension, vocabulary, grammar and writing.